The Bunker Loop Trail (in red on map the map below) starts at the intersection of the Great Brook Trail (SRKG, also known as Cocoa's Path, in green on map) which may be reached via the Pingree Connector (in blue) from the parking area (P) on Pingree Road. The trail proceeds uphill under the powerline then continues more steeply until it levels out and turns right onto an old woods road. Continue on the level then bearing to the right when you have a choice to an intersection with the Wolf Tree Trail. (SRKG). A loop can be made by continuing down hill on the Wolf Tree Trail to the Great Brook Trail then walking back along the brook to the Bunker Loop Trail. Access to the Great Brook Trail and the Wolf Tree Trail can also be made from the parking area (P) on Lakeshore Road. 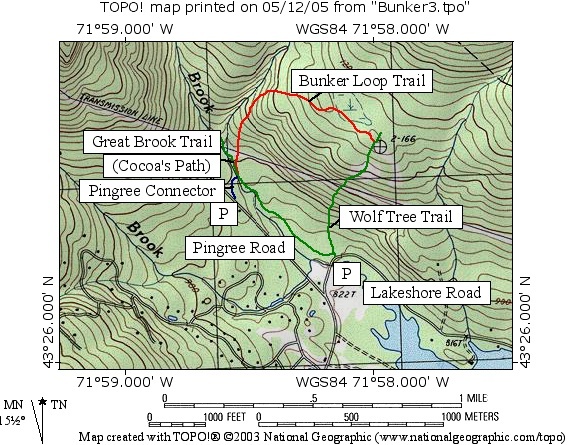 The elevation profile for the Bunker Loop Trail starts at the Wolf Tree Trail intersection and continues back down the trail to Pingree Road. The full loop is 1.7 miles; the trail from Pingree Road via the Pingree Conector to the Wolf Tree Trail is 0.8 miles (one way).